You can measure your baby’s temperature at first sight, with VisioFocus® Mini. The thermometer takes your baby’s body temperature without contact him and it projects the temperature reading on his forehead: it simply reveals the body temperature, without ever coming in contact with the skin. Visiofocus® Mini is an astonishing thermometer meant to allow moms and dads to take the temperature of their baby with comfort, safety, hygiene, but also with rapidity and precision, without waking him up when he is sleeping. 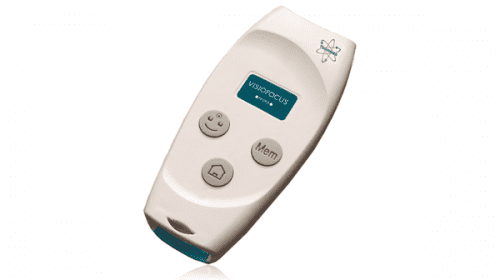 VisioFocus® Mini has been invented as the evolution of VisioFocus®. Visiofocus® and Visiofocus® Mini are the only thermometers in the world that project the temperature reading. 1. Approach VisioFocus •Mini• to the forehead. 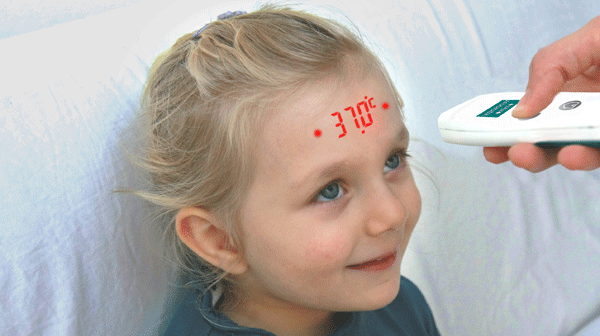 the light of the “face” button turn on and you will begin to see the temperature reading, projected onto the forehead between or overlaid to two dots. move it back or forth until the temperature reading is set squarely between the two dots : if the thermometer is too close, or too far away, the temperature value will be partially overlapped to the two dots (fig. 1 and 2). steady while the projection flashes and read the temperature value. If necessary, you can immediately take another reading. distance from the surface: in fact in this case, the thermometer is not taking a temperature,but only projecting the temperature value that has already been detected. For the following 3 seconds the projection will show the current setting before turning itself off. and other surfaces in the 1-80°C (33.8-176°F) temperature range. 1.	temperature of a baby’s feeding bottle, food, bath, etc. 2.	temperature of a wound, inflammation, scar (for medical use). Proceed as you would do for a forehead reading, but press the “home” button ; the projection will appear on the surface and the light of the “home” button will turn itself on. Read carefully the warnings and the instruction for use. Life of high quality batteries: more than 1 year or than 1.000 readings (depending on use). Distance from the subject: approximately 6 cm, calculated using an optical aiming system.